In this Nov. 5, 2015, photo, House Speaker Paul Ryan of Wis. smiles during his news conference on Capitol Hill in Washington. 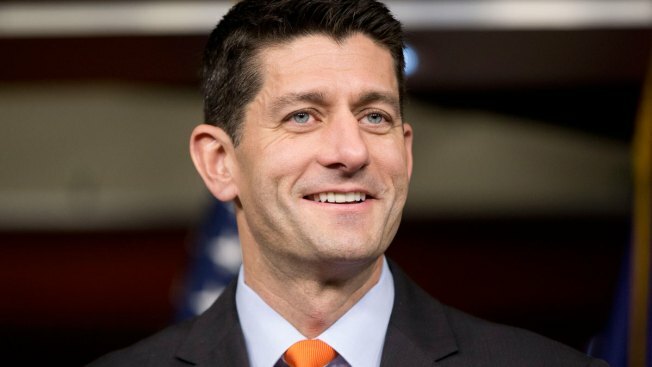 House Speaker Paul Ryan on Tuesday called for a pause in Syrian refugees coming to the U.S. in the wake of the Paris attacks and said the House will vote on the issue this week. "Our nation has always been welcoming but we cannot let terrorists take advantage," Ryan, R-Wis., said Tuesday. "Better to be safe than sorry. Take a pause in this particular aspect of the refugee program." Emerging from a closed-door meeting on Tuesday, Republicans said the chairmen of national security-focused committees were working on legislation dealing with Syrian refugees that the House could vote on as early as Thursday. The rush to stop the influx of Syrian refugees escaping Mideast violence troubled several Democrats, including Rep. Luis Gutierrez, who likened the reaction to the U.S. government turning away Jews fleeing Nazi Germany and placing Japanese in internment camps during World War II. "Let us as legislators rise above petty politics, rise above sectarian fears ... the underlying layer of xenophobia," Gutierrez said on the House floor. "Let us maintain America's commitment as a beacon of hope." A number of GOP presidential candidates and Senate Republicans issued similar calls to delay or stop accepting Syrian refugees, pointing to indications that one of the perpetrators in Friday's attacks might have entered France with a Syrian passport. Legislation could allow Republicans to block President Barack Obama's goal of bringing 10,000 more Syrian refugees to the U.S. during the current budget year. "Filling your country up with people who have a completely different belief system ... and expecting they won't rise up against their benefactor is foolish," Rep. Steve King of Iowa, a leading immigration hardliner, said in an interview. He said that no refugees should be permitted into the U.S. from Syria "unless they be Christian refugees that are facing genocide," and said that the spending bill should contain language specifying as much. Such comments drew criticism from refugee advocates and from some Democrats, even as most agreed on the need to redouble security and vetting efforts. "Are we to abandon allies and partners awash with refugees and refuse to do our part?" asked Rep. Adam Schiff of California, top Democrat on the House Intelligence Committee. The U.S. has admitted fewer than 2,200 Syrian refugees since Oct. 1, 2011 and the process for entering this country as a refugee is lengthy. Obama administration officials insist the vetting is good and that there is no need to back down from the goal of admitting 10,000 more refugees this year. The administration announced that goal earlier this fall after a photograph of a little Syrian boy washed up on a beach sparked calls for compassion, including from some congressional Republicans. Now the brutal Paris attacks have caused a backlash and some of those same lawmakers are calling for the U.S. to close its borders to refugees. Sen. Lindsey Graham of South Carolina, GOP candidate for president, was one of those who supported accepting more Syrian refugees. On Monday he called for a "timeout" in such admissions. But, not every Republican agreed with keeping out refugees. "We have a process in place, a pretty thorough vetting process," said Sen. Jeff Flake, R-Ariz. "We'll want to make sure that's thorough enough but I would want to do that before calling for a stop."